Potassium Aluminum Fluoride is one of the primary constituent in salt fluxes for metal cleaning, combined with other chloride and sulphate salts such as NaCl . The addition of fluoride aslts enhances the performance of the salt flux. These salt flux help in separation of metals from their oxides and dross and prevents further burning of the molter aluminum, therefore increasing its yield. When Potassium Aluminum Fluoride is added to a mixture of NaCl and KCl the resulting flux is more fluid. This increased fluidity better covers the exposed molten metal and facilitates the release of metals entrapped in the dross. Potassium aluminium fluoride is also used directly in magnesium rich aluminium alloys to remove and control of magnesium in the aluminium alloys. It is much safer in this applications where earlier Chlorine gas or HEXACHLOROETHANE were used, these gases cause local health problems and are also responsible for ozone depletion. Potassium Aluminum Fluoride is also used in the manufacture of grinding wheels (filler/binder) and other abrasive products. Other common applications of PAF are as additive to roofing shingles, where it acts as an alkaline Ph adjuster and flame retardant. It can also be used as color additive to the coatings for roofing granules. Glass producers use the PAF for opacification, or to cloud the glass giving it a milky white color. 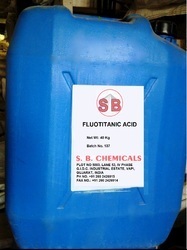 SB Chemicals is a trusted Fluotitanic Acid manufacturer and supplier having chemical formula H2TiF6. It is used as electroplating agent, metal cleaning and making diazo salts. 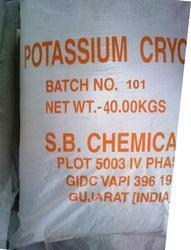 Looking for Potassium Aluminium Fluoride ?